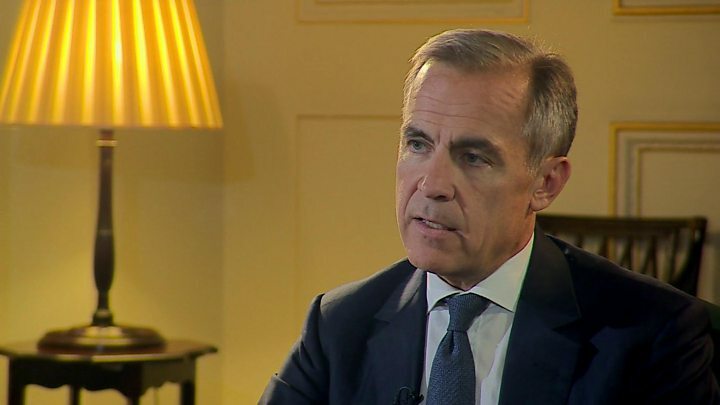 The Governor of the Bank of England has warned the global financial community not to become complacent, ten years after the financial crisis led to the worst economic downturn since the 1930s. In an interview to mark the anniversary, Mark Carney said major risks remained and that although a large part of the work to "fix" the financial system had been done, it was not a time for complacency. He outlined four risks to the UK's financial services sector, which is one of the largest in the world and supports more than a million jobs. First, high levels of household debt which led the Bank to put in place stricter rules on lending to people who may not be able to pay back mortgages or other loans. Second, that Brexit ends with a "no deal" which would mean major changes to how the financial system operates in the UK and disruption to the deep ties with the European Union. Third, the high levels of debt supporting the Chinese economy and questions over whether it is sustainable. Mr Carney said the Bank had been looking at how banks in the UK would fare if the Chinese economy took a substantially negative turn. He said that in terms of international financial risk, China was "top of the list". The fourth risk is a catastrophic cyber-attack which would render a major bank unable to operate. "Could something like this happen again?" Mr Carney said. "Could there be a trigger for a crisis - if we're complacent, of course it could. "History teaches us that there are financial crises from time to time around the world, we can come up with 60 or 70 examples over the course of the last century. "We want to have our banks, the infrastructure, the core of our financial system in a position that, if they make a mistake, if they take too many risks, they bear the consequences, not the system." Mr Carney said the Bank of England and other global regulators had done a huge amount to fix the financial system. "I think the system as a whole is fairer," he told me, pointing out that retail banks such as the Royal Bank of Scotland, Lloyds and Barclays had to "ring-fence" their operations serving millions of customers with bank accounts, mortgages and savings, from riskier global investment banking. "We're setting up the banks - ring fencing the banks - having them hold their own funds against potential future failures, so that if there is a failure in the future, the cost is borne by big investors, not by the tax payers. "The system has changed quite fundamentally." Image caption The Chinese economy is a success story, but levels of debt are worryingly high, according to Mark Carney. The governor said that regulators around the world needed to remain vigilant and that any fragmentation of global standards to try and gain competitive advantage would be dangerous. He said no one should engage in a "race to the bottom". "We have to think about not why things are going to go right, but what could go wrong," he said. "What could happen [for example] when we think about the changing relationship with the EU? "Part of our job at the Bank of England is to think about what could go wrong in that circumstance and how do we prepare our banks, our financial system, so that it's there regardless of the outcomes of the negotiations. "There are risks around Brexit, for the financial sector. "And here's something that's changed with the system from 10 years ago - we are absolutely upfront about those risks, our view of those risks. "We have stressed test our banks against those risks to make sure they have enough of a safety net, both in terms of their own funds plus liquid funds, in case we had a no deal Brexit." He said when he thought of the major risks globally, China was at the top of the risk register. "China is a great source for growth for the global economy, it's an absolute economic miracle, lots of positives," the governor said. "At the same time, their financial sector has developed very rapidly, and it has made many of the same assumptions that were made in the run up to the last financial crisis. "So there's a big so-called shadow-banking sector in China, there's a lot of lending that's based on very good past-experience. "But there's so much lending that the quality has gone down quite substantially. "The level of debt is enormous relative to the size of the economy."